Commercial vineyards produce large quantities of grapes for use in wines, juices and jellies. Home gardeners also grow grapes on a smaller scale for their own enjoyment. 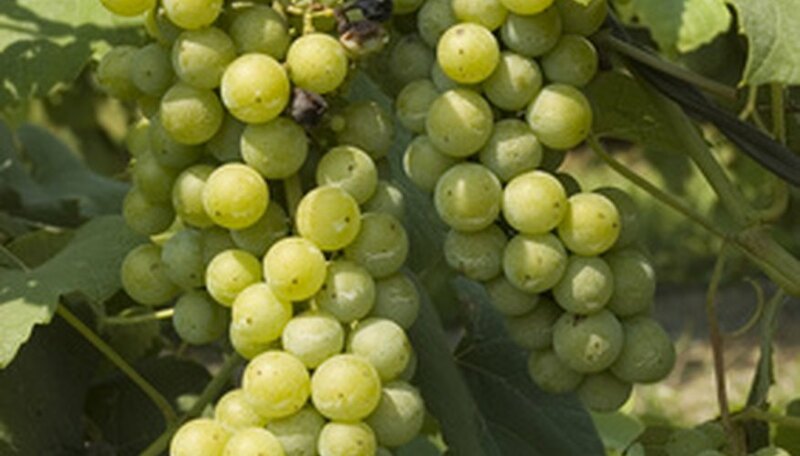 Many gardeners enjoy eating fresh grapes directly from the vines, in addition to preparing them for later use by canning and freezing. A small vineyard creates interest among other landscape and garden plants. Enjoy many years of grape production by correctly caring for and maintaining your grape vines. Trim branches from nearby trees and shrubs that block the sun from reaching your grapes. Grapes require full sunlight to thrive. Use a branch saw to thin out trees and remove lower branches. Check your vineyard for any large vegetation growth that limits the grapes’ exposure to sunlight, as well as tall fences or other structures that stand in the way. Install strong stakes near the base of each grape vine after the first year of growth. Use 2-by-4-inch treated wood to avoid rotting below the surface of the soil. Purchase your wood in 8-foot long sections. Hammer one end of the stake into the soil a few inches away from the base of each grape vine. Insert 2 to 3 feet of the stake into the soil to ensure stability. Gently tie the vines to the stakes with garden twine. Prune your grape vines with pruning shears to encourage healthy, new growth. Remove suckers from the base of your vines every year by cutting these new shoots at the ground level. Trim off any damaged or broken vines and remove dead portions with your shears. Haul away all pruned vegetation to avoid rotting debris in your vineyard. Fertilize your grape vines to ensure adequate levels of nutrients. Apply a nitrogen fertilizer every year in the early spring, shortly before the anticipated first growth after winter dormancy. Use approximately 1 lb. of fertilizer per plant. Mix and apply according to the manufacturer’s directions. Mulch your grape plants to reduce weeds and retain soil moisture. Place approximately 4 to 6 inches of mulch, such as clean straw or shredded bark over the roots of your grape vines. Remove and replace old mulch every year before the beginning of winter. Cover developing grape clusters with fine netting to protect against birds. Avoid using herbicides near your grape vines. Herbicides may cause withering and poor fruit production in grape vines.